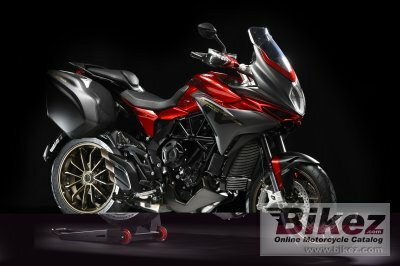 2018 MV Agusta Turismo Veloce 800 Lusso. Picture credits - MV Agusta. Submit more pictures. The Lusso (luxury) version takes the technical level of the Turismo 800 even higher with electronically controlled semi-active suspension as standard equipment, as well as heated hand grips, a centre stand and built-in GPS sensor. Fuel system: Injection. MVICS 2.0 (Motor and Vehicle Integrated Control System) with three injectors. Comments: Immobilizer. Heated Grips. Bluetooth. Cruise control. Integrated GPS sensor. Central stand. Adjustable windshield. Ask questions Join the 18 MV Agusta Turismo Veloce 800 Lusso discussion group or the general MV Agusta discussion group. Bikez has discussion forums for every bike. View comments, questions and answers at the 2018 MV Agusta Turismo Veloce 800 Lusso discussion group. You can sign up for e-mail notifications when other riders answer you. If you have extensive experience with the MC, please send us a review. If you consider buying this bike, you should view the list of related motorbikes Look at photos. Compare technical specs. And check out the rating of the bike's engine performance, reliability, repair costs, etc. You can compare the rating with other bikes.